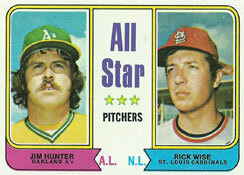 In 1973, Rick Wise was the winning pitcher in the All-Star Game. No Cardinals pitcher has won an All-Star Game since. Dizzy Dean (1936) and Steve Carlton (1969) join Wise as the only Cardinals pitchers with All-Star Game wins. National League manager Sparky Anderson wanted the Dodgers’ Don Sutton to be his starting pitcher in the 1973 All-Star Game at Kansas City, but after consulting with Walter Alston, the Dodgers’ manager, Anderson determined Sutton wasn’t ready. “Sutton is the guy I’d like to open with, but he’s been pitching a lot,” Anderson said to the Associated Press. Wise, 11-5 with a 3.10 ERA for the 1973 Cardinals entering the July 24, 1973, All-Star Game, was Anderson’s backup choice to oppose Catfish Hunter. “It’s a great honor for me,” Wise said. Wise had been named an all-star in 1971 while with the Phillies, but didn’t appear in the game. Seven months later, Wise was traded to the Cardinals for Carlton. The Phillies got the best of that deal. Carlton built a career that earned him election to the National Baseball Hall of Fame. However, in July 1973, Wise was on the all-star team; Carlton wasn’t. Wise retired the American League all-stars in order in the first, striking out Bert Campaneris and getting Rod Carew and John Mayberry on ground outs. In the second, Reggie Jackson led off against Wise with what the Associated Press described as a “booming double off the center field wall.” Amos Otis followed with a single, scoring Jackson and giving the American League a 1-0 lead. Wise retired the next three batters _ Bobby Murcer, Carlton Fisk and Brooks Robinson _ on fly outs. Scheduled to lead off the third, Wise was lifted for pinch-hitter Darrell Evans, who walked, sparking a two-run inning against Bert Blyleven, who had relieved Hunter. Wise won just five of his last 12 decisions and finished the 1973 season at 16-12. He was traded to the Red Sox three months after his all-star start and helped them win the 1975 pennant. He never was named to another all-star team. Since 1973, only two Cardinals pitchers have started All-Star Games. Chris Carpenter had a no-decision in the 2005 game, which was won by the American League, 7-5. Adam Wainwright had a no-decision in the 2014 game, which was won by the American League, 5-3.